We have great news for web developers that use Firebase Cloud Messaging to send notifications to clients! The FCM v1 REST API has integrated fully with the Web Notifications API. This integration allows you to set icons, images, actions and more for your Web notifications from your server! Better yet, as the Web Notifications API continues to grow and change, these options will be immediately available to you. You won't have to wait for an update to FCM to support them! Below is a sample payload you can send to your web clients on Push API supported browsers. This notification would be useful for a web app that supports image posting. It can encourage users to engage with the app. Notice that you are able to set new parameters, such as actions, which gives the user different ways to interact with the notification. 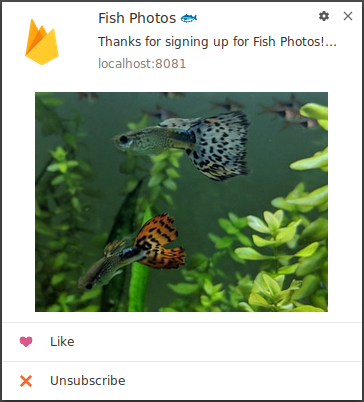 In the example below, users have the option to choose from actions to like the photo or to unsubscribe. The SDK will still handle regular notification clicks and redirect the user to your click_action link if provided. To see more on how to handle click actions on the client, check out the guide. Since different browsers support different parameters in different platforms, it's important to check out the browser compatibility documentation to ensure your notifications work as intended. Want to learn more about what the Send API can do? Check out the FCM Send API documentation and the Web Notifications API documentation. If you're using the FCM Send API and you incorporate the Web Notifications API in a cool way, then let us know! Find Firebase on Twitter at @Firebase, and Facebook and Google+ by searching "Firebase".